In Chapter 3 of The Genius Hour Guidebook, “Diving In and Letting Go,” Denise and Gallit reference the KWHLAQ Chart as they share ideas about how to help Genius Hour students organize their 21st century learning. Here’s some of what they say (pp 29-31). Many students will rely on some sort of research process for their Genius Hour project and for that we would like to suggest the use of the KWHLAQ chart. You have heard of a KWL chart before – well, this is similar and, no, we didn’t just accidentally hit the keyboard with our elbow. It is meant to have all those letters! It is much more detailed than your old KWL. We love this beautiful alternative to the KWL chart. Paul Solarz, Illinois elementary school teacher and author of Learn Like a Pirate, has used the KWHLAQ chart created by Silvia Rosenthal Tolisano to guide student inquiry. Silvia has shared the KWHLAQ chart on Flickr with this Creative Commons license, CC-BY-NC-SA-2.0 (which means that you are free to use, copy, remix and redistribute this KWHLAQ chart for non-commercial uses with a share-alike license – just make sure you attribute the original KWHLAQ chart to Silvia). 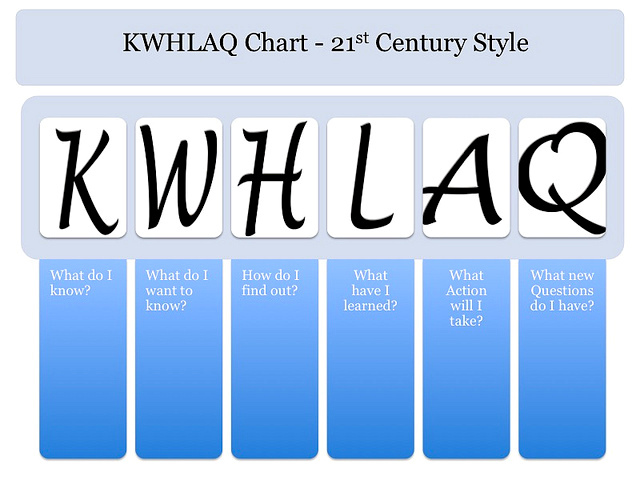 The KWHLAQ chart is used to organize twenty-first-century learning. Students record what they know, what they wonder and what they’ve learned, just like the traditional KWL chart. Sandwiched in between, though, is an important piece on how. How will I research and find out what I won­der about and want to know? To teach the how is a much more complicated process now than it was for many teachers when we were young students…. …And don’t forget the Action column of the twenty-first-century KWHLAQ chart: “What action will I take?” When Denise first tried the KWHLAQ chart, it was during science class with seventh graders. In a genetics unit, she asked students to complete the KWHLAQ chart, and she was so excited to see them take seriously the Action column. Students began to create and dream about how they could take action in fighting genetic diseases. You can read more about student action improving the world in Chapter 7.